Laughter is good for health, but for Savitha & Ram laughter has turned out to be good for wealth. 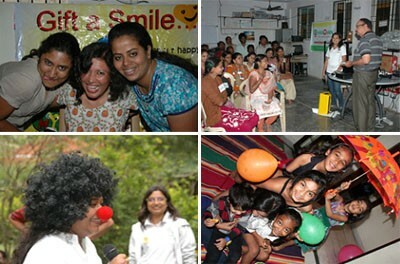 Read the story of HASOVAN that has developed its complete business model around laughter. Hasovan, a Private Limited company established in 2012 is a startup providing solutions to enhance wellness through laughter holistically. The first of its kind globally to develop innovative concepts, techniques, therapies, evolving biomedical products and devices dedicated to harness the power of laughter for the welfare of human body and mind. We believe that Laughter is the best medicine. Our Vision is to bring a smile across every face irrespective of age, gender caste, colour, creed or language. Our Mission is to use laughter in a holistic form on the body, mind, heart and soul by enhancing wellness Today! Stress, Loneliness, Depression, Tension, Feeling down, Anxiety, Fear, Insecurity, Lack of communication are part of our lives. These symptoms when left untreated signal major life threatening diseases ahead. The chances to laugh are diminishing day by day. Hasovan will create "chances with choices" for people to laugh through the concept of MyT (Mantra / Yantra / Tantra) Laughter. What happens when you laugh? Which all ways to laugh? Whom should you laugh at? How to harness the power of your laughter? Hasovan has come out with the patent pending prototype of the laughing chair. The Laughing chair (Title of the invention) is an intelligent seating arrangement for relieving stress. (Indian Patent Application No. : 1350/CHE/2012 dated April 03, 2012). Hasovan also has developed a unique Laughter Quotient software application to determine the laughter quotient of a person. Laughter Programs: range from 2 hours to 2 days and cater to sessions in educational institutions, corporate, hospitals, wellness centres and old age homes. Customised programs will be designed exclusively as per organisation's need. An Instrumentation Engineer, is managing the research and development of bio-medical products and devices beneficial to human health. Visualise, Plan, Conceptualise and also involved in Marketing and Branding. Recently appointed as Joint Secretary IET of Bangalore Local Network for Professional Women Wing. Ram Sundher - HumouRam, the Happiness Guru. An electrical engineer by qualification has dedicated his career to pursue motivational and inspirational humour in real life situations. He is popularly known as HumouRam. A human behaviourist, trainer, humorist, professional speaker, personal counsellor and a national award winner who enhances productivity and health through fun and humour. The strategy is to roll out the concepts in 4 phases. Laughter programs are in the first phase. Do log on to our website www.hasovan.com or send a mail to humouram@hasovan.com / savitha@hasovan.com for any kind of enquiry. Any facts, figures or references stated here are made by the author & don't reflect the endorsement of iU at all times unless otherwise drafted by official staff at iU. This article was first published here on 26th November 2013.